In this article, we will discuss the different types of metals you can use for roof. As always, we’d advise using a local roofing company if you’re considering any of the below. For example, if you’re in Tampa, then consider a Tampa Roof repair company who you can trust to repair and install a new roof. Lightweight, durable, and corrosion resistant, aluminum is a great option for almost any residential metal roofing system, including standing seam, shake, shingle, tile, and slate profiles. Aluminum will never rust, so it is an ideal metal for coastal applications and other areas where steel might be in danger. Aluminum’s propensity to resist rust gives it an extremely long life span. One of the first architectural aluminum applications was the cap on the Washington Monument in 1885. It was around this time that processes to separate aluminum from bauxite and then manufacture building grade aluminum alloys became efficient enough to make aluminum a viable option for the building industry. Prior to that, aluminum had been considered a precious metal. These days, virtually all aluminum roofing is prepainted, and aluminum can be found in just about any profile in which metal roofing is manufactured. In fact, more heavily formed products lend themselves very well to aluminum due to its high malleability and the fact that heavy forming adds additional structural strength. Aluminum roofing is usually manufactured from a large percentage of recycled material, the majority of which is post-consumer material such as used beverage cans. The recycled content of aluminum roofing will usually be 90 – 95%. One square of aluminum roofing (.019” thick) can use as many as 1,152 aluminum beverage cans—closing the recycling loop for the consumer. American Metal Roofs provides several aluminum product lines. Many homeowners easily make the decision that aluminum is the best choice they can make in terms of overall value for their roof. Advantages: Lightweight, rust free, attractive, energy efficient. Disadvantages: More expensive than steel. Not as hail resistant, particularly in less-formed profiles. Thicknesses: .019” for shake, shingle, and tile. Minimum .032” for standing seam and for some heavier tile profiles. Weight: As low as 45 lbs. per square. Recycled Content: Usually around 95% (mostly post-consumer). Base carbon/iron steel coated with an alloy of aluminum and zinc is known as galvalume steel. When aluminum is added with zinc, both of the positive and negative attributes of aluminum are magnified. Because aluminum itself is a very corrosion-resistant metal, galvalume steel is also very corrosion resistant, i.e. the aluminum/zinc alloy provides barrier protection, as opposed to galvanic. The negative aspect of aluminum in the alloy, though, is that galvalume doesn’t self-protect scratches or cut edges as well as galvanized steel does. Galvalume steel is also more susceptible to a process known as “tension bend staining.” When steel is formed into the various metal roofing profiles, the galvalume zinc/aluminum and the galvanized zinc coatings are spread very thin over areas in the metal where there are deep folds or tight bends—so thin that the coating has a tendency to form microscopic cracks. Because of galvanic action of zinc, galvanized steel is able to protect these scratches with little harm. With galvalume steel, however, the aluminum in the alloy somewhat neutralizes zinc’s galvanic properties and therefore the galvalume steel isn’t able to self-protect the cracks, or other scratches in general. Tension bend staining occurs when moisture or other corrosive elements permeate these cracks and facilitate rusting. The result is “stains” of rust in areas with folds and bends in the metal. Over time, this corrosion will spider its way under the metallic coating, causing further deterioration. For this reason, galvalume steel is used most commonly in rather simple profiles, such as standing seam, because there isn’t quite as much bending in the metal. Because galvalume steel is more corrosion-resistant than galvanized, it is sometimes installed unpainted or with a low cost acrylic clear coat. While this is most often done in commercial applications, homeowners who like the bright, shiny metallic look have selected unpainted galvalume as well. Most galvalume, though, like galvanized, is painted for added durability and beauty. Advantages: Very corrosion resistant, strong, relatively inexpensive (but often slightly more expensive than galvanized). Disadvantages: Susceptible to tension bend staining, limited profile availability (mostly standing seam or simple shingle styles), must be cut with a shearing action rather than saw-cut. Thicknesses: 24 gauge (.024”) is most common for standing seam systems. Weight: Between 100 and 150 lbs. per square (100 sq. ft.). Recycled Content: Usually around 35%. Because the traditional carbon/iron steel alloy is rust prone when exposed to the elements, steels used for the metal roofing industry are coated with a specific thickness of another metal or alloy on both sides of the base carbon/iron steel strip. The process used to accomplish this is called the hot-dip process, and involves running the steel through a molten bath of the metal to be applied. The hot-dipped process is basically a cheaper, more efficient alternative to a similar process called electroplating. Steels are classified and named according to the metal that is applied. Galvanized steel is base carbon/iron steel with a metallic coating of zinc. The coating metal offers two kinds of protection: galvanic or barrier. Galvanic protection is a self-sacrificial process by which the metal coating gives itself up rather than allow the base metal to corrode. Barrier protection is simply that the coating metal keeps the elements from reaching the base metal. In the metal roofing industry, galvanized steel is used more often than any other metal and is available in most metal roofing profiles. It is lower cost than most other metals, strong, and has a great affinity to hold paint. Because zinc provides galvanic protection, scratches on galvanized steel are somewhat self-protected or “band-aided,” preserving the steel from rust. Therefore, the life-span of galvanized steel depends largely on the thickness of its metallic coating since the more zinc that is present, the longer the steel is able to remain protected and rust-free. G-90, the most common zinc thickness used in the metal roofing industry, means that 0.90 ounces of zinc are coated per square foot of steel surface. Lesser grade-galvanized steels are G-30 and G-60 and should usually be avoided for residential applications. Always check the manufacturer’s specifications to determine the thickness of the steel’s metallic coating. It is important to note that G-90 only refers to the thickness of the zinc coating, not the thickness of the steel itself. That thickness is measured in gauge number (26 Gauge, 24 Gauge, etc.) and depends on the profile of the steel metal roofing product to be used. In regards to the overall metal thickness, the higher the gauge number, the thinner the metal is. With a few exceptions, such as mill-finished shingles or other metal roof styles, all galvanized steel systems are coated with a base paint coat of some sort. 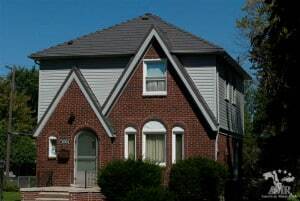 In addition, many of the higher quality galvanized steel metal roofing products, especially shake, shingle, and tile systems that are used largely on residential applications, come with an added “post-forming” coat to help protect against corrosion in areas where the metal was refashioned during the manufacturing process. This is discussed in further detail in the Coatings section. Galvanized steel is not a good option for homeowners in coastal areas or areas with an above average amount of corrosive elements in the air. Salt spray and other elements can speed up corrosion and shorten the life of galvanized steel. Overall, though, with consideration just for the metal itself, galvanized steel is very applicable for residential products. Advantages: Strong, lower cost, comes in almost any look. Disadvantages: Shorter life span than other metals, can rust prematurely if not used or installed properly, can be more difficult to work with, must be cut with a shearing action rather than saw-cut. Thicknesses: 26-28 gauge (.018” – .014”) is the most common for shake, shingle, tile, and slate profiles. 24 gauge (.024”) is most common for standing seam systems, with a good amount of 26 gauge as well. 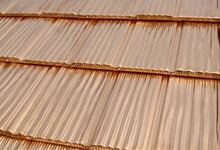 Copper is generally recognized as one of the most attractive metal roofing options. Unfortunately, it carries a pretty hefty price tag. Copper is the most expensive of the three most popular roofing metals (steel, aluminum, copper – in increasing order of expense). 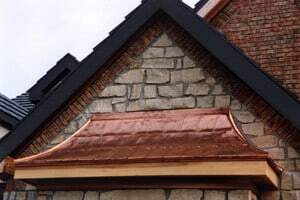 Rarely used over an entire residential roof, copper is mainly used for accents over bay windows, dormers, or other areas where a touch of elegance is desired. Copper is used often on historic buildings, church steeples, cupolas, and the like. 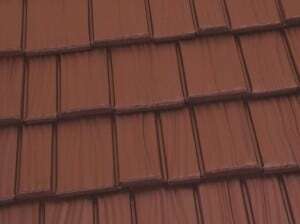 Copper is installed in short standing seam panels or sheeting, but there are some copper shingles available as well. Classic’s Chateau Slate and Oxford Shingle are both available in copper and are ideal choices for the applications mentioned above. 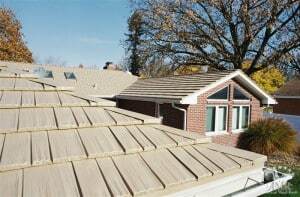 Sometimes copper is used as a flashing material in conjunction with other roofing materials. However, copper is not recommended for use with aluminum or steel roofing. This is not only because most residential metal roof systems come with their own preformed flashings, but also because if copper is left in direct contact with a dissimilar metal it will speed up the deterioration of the other metal through galvanic action. As the copper patinates, the water runoff has a tendency to stain other metals, brick, concrete, and almost anything else with which it comes in contact. Therefore, it’s important to understand where the water runoff over a copper portion of a roof is being directed and how it is channeled off of the roof. As an alternative, and to solve this problem, lead-coated copper is sometimes used as a replacement for pure copper. This is being done less often, though, due to the public outcry against anything lead-related in building products. Copper is best known for its attractive blue-green, or verdigris patina that forms when left exposed for 8-15 years. The actual length of time to completed patination depends on what is in the air; salt spray in a coastal environment, for example, dramatically hastens the process. The patina is like a barrier against corrosive elements and is part of the reason for copper’s extremely long life. While copper can be treated to speed up or slow down the patination process, or even be purchased pre-patinated, most homeowners elect to allow copper to weather naturally, so as to ensure the rich, luxurious verdigris look. Because copper is relatively soft and malleable, it is fairly easy to work with and usually solders well. Copper is extremely durable and has a very long life—sometimes more than 100 years. Copper has been used extensively for hundreds of years in the United States. One of the first applications was the Massachusetts State House. The copper for this project was one of the first orders for Paul Revere’s newly founded copper rolling mill in 1801. Recent coatings technology has brought homeowners the option of choosing steel or aluminum roofing that has been coated to resemble copper. Finishes are available from bright “new” copper to fully weathered copper, as well as coatings designed to look like copper in varying stages of the patination process. Classic offers several colors along this line on its aluminum roofing systems, giving homeowners an option of the permanence of copper at a lower cost. Advantages: Beautiful, extremely durable, easy to work with, easily solderable. Disadvantages: Expensive, runoff will streak or stain other materials, natural patination takes time. Thicknesses: .12 oz. (.016”) and 16 oz. (.022”) are common for pre-formed shingles. 16 oz. (.022”) and 20 oz. (.027”) are common for vertical seam. Weight: Between 100 and 150 lbs per square. Recycled Content: Varies but is often around 35%. There are other metals available for roofing as well including rolled zinc, stainless steel, terne-coated steel, terne-coated stainless, and titanium. Generally, roofs made from these more exotic metals will be architectspecified and will be custom-formed by a fabricator for a particular application. There are literally dozens of different “looks” and “feels” that can be achieved with metal roofing— from the traditional standing seam look, to the old-world tile look or the beauty of shakes, to the more agricultural corrugated look. The variety of attractive metal roofing profiles is one of the great advantages of the industry. No matter what the style or look of your home, there is almost certainly a metal roof system out there that will complement it perfectly! The growth in demand for standing seam in the residential roofing market over the past few years may be exceeded only by the growth in popularity of the “new metal roofs” – the shake, shingle, tile, and slate profiles. These products allow homeowners the opportunity to have the benefits of metal roofing along with the looks of something very traditional and timeless. The four different types of these “modular” panels can vary greatly in terms of look and use. Following is a description of all four. Metal shakes are designed to mimic the look of hand split cedar shakes. While many homeowners select these shake systems because of their resemblance to wood shakes and also because of the long-term performance metal provides, many other homeowners enjoy these specialty metal shake systems for their own unique and distinctive look. These modular panels come in various sizes with common dimensions of 2’ x 1’ and 4’ x 1’ and are usually fastened to the roof deck with a concealed clip system or a nailing flange formed into the top of the shingle. Shake and shingle facsimile profiles are installed on the roof in a staggered pattern to avoid vertical line repetition. The shake systems are usually more “high-profile” than shingle systems, meaning that they are designed with a little more dimension and texture. Many times, this added dimension to the shingle allows it to be installed directly over previous roof layers, even some thin wood shingles. Metal shakes are usually manufactured from 26 or 28 gauge steel, or .019” or .024” thick aluminum. Steel metal shakes are commonly coated with a post-forming stone coat or Kynar powder coat. This helps seal the edges in areas where the zinc or zinc/aluminum alloy coating has been spread thin over areas of tight bends. Some manufacturers, including Classic Metal Roofing Systems, also offer aluminum shakes with the special post-forming coats, but in the case of aluminum, these coats are selected more for aesthetic reasons than to ensure the functional soundness of the system. 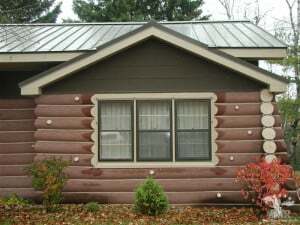 Most metal shake systems come with a complete line of pre-formed flashings, which usually includes hip caps, ridge caps, gable trim, sidewall flashing, eave starter, and valley. These are typically universal flashings designed to work with any roof pitch. Higher-quality metal shake systems utilize an open valley system to help ensure that leaves, ice, pine straw, etc. do not obstruct the valley and cause water to back up under the panels or the valley itself. It is usually a good idea to inquire with your contractor about the type of valley flashing used with the metal roof system you are considering. 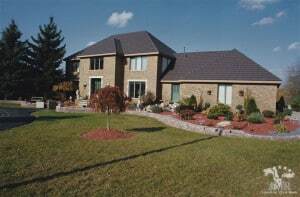 Metal shingles are similar to metal shakes except with a lower-profile design. Many homeowners who are fed up with the short lives of the traditional machine split wood shingle select metal shingles for their durability and beauty. Also since metal shingles look more like dimensional standard shingles, some homeowners choose them for their ability to blend in with a more modest neighborhood look. Like the shake profiles, the shingle metal roof systems are modularized panels fastened to the roof deck most commonly with a clip system, or sometimes with a nailing flange formed into the top of the shingle. Metal tile profiles come in a wide variety of looks and feels, from the exotic Mediterranean barrel tile look to the stately S-Serpentine look. Most tile profiles are throughfastened usually with exposed fasteners, and some utilize a batten grid attached to the roof deck to which the panels are attached. Most metal tile systems are made in large sheets that typically stretch from eave to ridge. Fewer seams and quicker installation are a plus, but waste can be dramatically increased with such systems. Metal slate profiles are manufactured in steel, aluminum, and copper to replicate the look of natural slate. The advantage of metal facsimile slate profiles is that they are about thirty to fifty percent the cost of real slate, and are also much, much lighter than traditional slate – which can help prolong the life of older buildings. Some other, more exotic profiles, such as diamond shapes, scalloped, and flat tiles are available in metal roofing. Standing seam is probably the most recognizable profile of metal roofing for both commercial and residential projects. The popularity of standing seam has grown so much in recent decades that many people automatically assume that standing seam is implied by the term “metal roofing.” Standing seam provides a very contemporary, distinctive look, and is chosen to complement homes of all styles. The key, though, to choosing the right standing seam depends on the actual dimensions of the roof. More often than not, residential roofs are smaller, more compact, and more complex than commercial roofs. For this reason, it’s advisable to select a standing seam roof with a relatively small panel width – usually around 12 inches. Wider panels will present a more commercial look to the roof, obviously a condition to be avoided when selecting metal roof for a home. There are literally dozens of different “looks” and “feels” that can be achieved with metal roofing— from the traditional standing seam look, to the old-world tile look or the beauty of shakes, to the more agricultural corrugated look. The variety of attractive metal roofing profiles is one of the great advantages of the industry. No matter what the style or look of your home, there is almost certainly a metal roof system out there that will complement it perfectly! Unfortunately, the variety of profiles is sometimes one of the industry’s detriments as well because it can lead to improper products being used for less than ideal applications. The following section should help you make an informed choice about the product that will work best, both aesthetically and functionally, for your home. As mentioned in the section on through-fastened vs. clip-fastened systems, standing seams can be either through- or clip-fastened. Through-fastened standing seam systems are less common and utilize a fastening “flange” that runs the length of the panels. The fasteners are driven through this flange and then concealed by the subsequent panel. So, although the fastener is concealed to the elements, fastening still occurs directly through the panels. These systems are more cost effective options, but since most quality standing seams used residentially are continuous panels—meaning the panels are custom formed to the length of the rafter—using these through-fastened panels is not recommended on longer rafter lengths. The reason is that the longer the panel, the more it will expand and contract, and the more likely to fatigue fasteners, “wallow out” fastener holes and also to oilcan. These through-fastened panels are a good option, however, for shorter runs such as porch accents or bay windows. This helps to ensure that the system will maintain its water tightness much longer, and also its aesthetics, as oil canning will be less of a concern. For longer runs, or even for shorter runs downhill from longer roof runs, it is also recommended that a system with a higher rib is used. The rib is the portion of the standing seam that gives it its dimension, and is also the joint of the two adjacent panels. Higher ribs will give the panels more capability to carry water down the entire rafter length, and thus prevent water from spilling over the panels and possibly backing up under an overwhelmed rib or other flashing. Standing seam roofs are most commonly manufactured from galvanized or galvalume steel and range in gauge from 18 for the heavier structural products (rarely used residentially) to a lighter 26 or even 28 gauge for simpler projects. Gauge 24 and 26 are the most common for residential steel standing seams. Some high quality standing seams, like Classic’s ClickLock Premium Standing Seam are manufactured in heavy gauge aluminum ranging typically from .032” to .050” with .032” common for residential applications. Many standing seam systems, like ClickLock, come with an entire array of preformed flashings. These flashings help reduce installer error and help ensure a watertight roof for many decades to come. Flashings for true standing seam systems usually need to be custom-made for each job in order to exactly meet the pitch and other geometry of each individual roof. Sheet metal roofing is available in many different profiles, all going by different names. “5V” Crimp, “R” Panel, corrugated roofing, face-fastened panels, through-fastened panels, or screw down panels are some of the synonyms for the style of metal roofing that is encompassed under the umbrella term “sheet.” Metal sheet roofing is manufactured primarily from galvalume or galvanized steel in thicknesses that vary between 24 and 30 gauge. The defining characteristic of all sheet roofing is large panels (or sheets) of varying widths and lengths that overlap and have exposed fasteners. The fasteners are driven through the overlapping portions of the panels, as well as in other strategic locations and into the roof decking, purlin, or spaced sheathing below. A neoprene washer is located beneath the head of the fastener to ensure water tightness. One common type of sheet roofing is the 5V Crimp pattern. It has five small V crimps per panel. Other corrugated patterns of sheet roofing give a more “wavy” look. The look of any of these products is sometimes construed as an agricultural or rural look. Sheet roofing can also give a historical look, particularly if used unpainted. 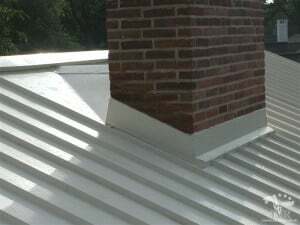 Sheet roofing can be installed painted or unpainted. Because sheet roofing is often chosen as a more economical type of metal roofing, the paints used on sheet metal roofing are often lesser quality. This saves even more money on the overall system. Generally, sheet roofing systems should be examined closely before being selected for residential projects looking for a lifetime roof. While most sheet roofing is still higher quality than many traditional roofing materials, it contrasts sharply with some of the more technologically-advanced metal roofing options available to homeowners who want to make lasting investments in their homes. I’d like to learn more about American Metal Roofs and its affiliated companies’ products, sales events or promotions in the future. I understand you may use an automatic phone system and text messages to reach me at the telephone number I provided above. I understand I don’t need to submit this form to receive a free estimate.